A recently posted and unearthed Geekbench listing has shown a device that could be truly unique, as it suggests a joint effort from smartphone giants Huawei and Samsung, who have generously brought Sony along for the ride. However, disappointingly, this potentially majestic device only scored a measly 1,623 points in the single-core test and sports a Snapdragon 660 SoC. However, the Geekbench entry delivers nothing but disappointment. It starts reasonably well, with the knowledge that Android 9 Pie would be the OS for this divine device. But it all goes downhill from there. A distinctly non-flagship offering of 4 GB RAM won’t set any hearts aflutter and a Qualcomm Snapdragon 660 from 2017 isn’t going to offer the speeds we would expect from a Mate/Galaxy/Xperia hybrid. With scores of 1,623 points for the single-core test and 5,342 points for the multi-core test, this legendary animal makes a Coolpad Cool S1 look fast in comparison. But there are some telltale signs in this particular Geekbench record that point to some fakery. Would any of these top OEMs really choose an SD660 for a flagship device? Also, 4 GB clearly doesn’t cut it either in this world where RAM should be in double figures for a high-end smartphone. Of course, it’s always important to take Geekbench entries with a pinch of salt. 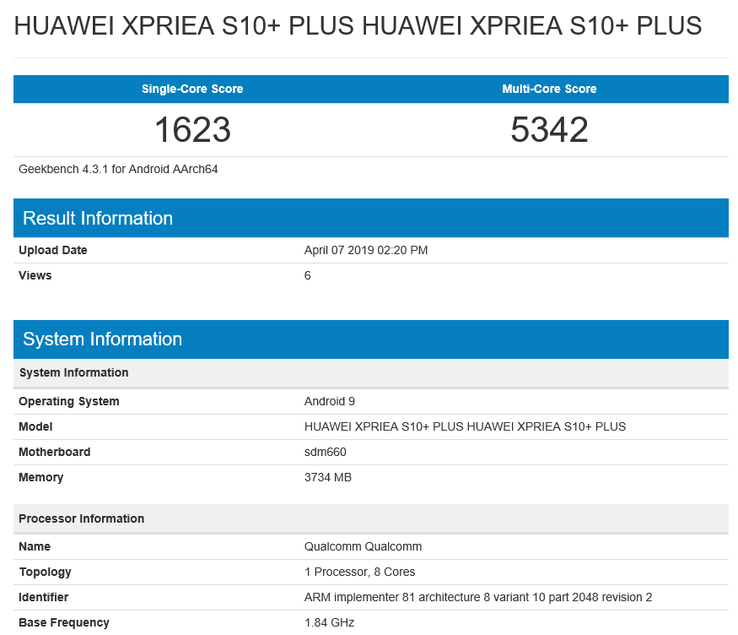 It’s a shame though, as the “Huawei Xpriea S10+ Plus” (sic) could have been the ruler of the smartphone world, because how many other devices are so good they actually warrant the suffix “+ Plus”?